Corrine Kozlak, author of our upcoming cookbook Rhubarb, shares with us her recipe for Rhubarb Scones and Strawberry-Rhubarb Jam. LET’S MAKE THE BEST SCONES EVER! Preheat oven to 375 degrees. Combine rhubarb with 1 tablespoon sugar in a small bowl. Place remaining sugar, flour, baking powder, soda, and salt in the bowl of a food processor with a metal blade; pulse twice to combine. Scatter butter over flour mixture, and process until mixture resembles coarse meal. Slowly add buttermilk, and process just until a soft dough forms. Place dough on a lightly floured surface. Sprinkle rhubarb mixture on top. Using an ice-cream scoop, spoon 16 (1⁄4-cup-size) dough rounds onto a parchment paper-lined baking sheet, about 1 inch apart. Sprinkle lightly with raw or large-crystal sugar. Bake for 25 minutes. The recipe makes 16 rhubarb scones. 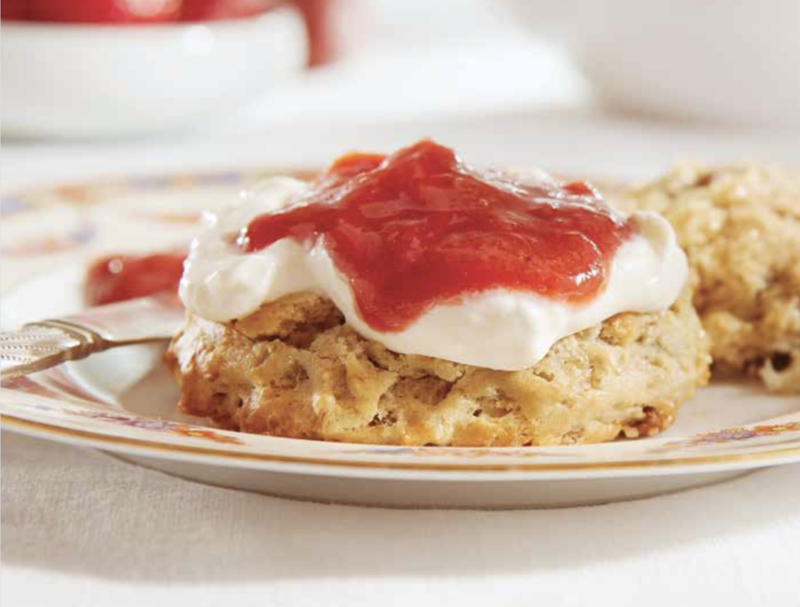 Serve warm with Americanized Devonshire Cream and Small-Batch Strawberry-Rhubarb Jam. Americanized Devonshire Cream: Combine 1 cup whipped cream cheese spread, 1 cup sour cream, and 1⁄4 cup granulated sugar in a medium-size bowl. Whisk together until creamy and thick. Makes 2 cups. Combine rhubarb, strawberries, sugar, and orange juice in a large saucepan over medium-high heat. Bring to a boil; reduce heat to medium-low, and cook 45–50 minutes. Fruit will cook down and thicken. Stir occasionally to prevent burning. Cool; cover and refrigerate. 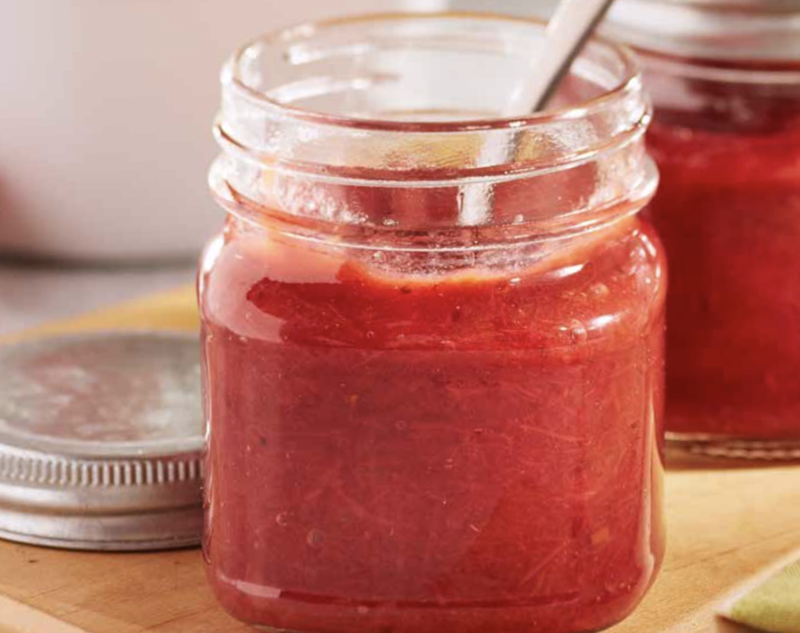 No canning is required for this great, 4-ingredient homemade jam. Store in an airtight container in the refrigerator up to 3 weeks. Enjoy these scones alongside a spot of Earl Grey or Rose Congou hot tea. Delicious classics are classics for a reason. To be proper, serve scones warm. Place enough cream and jam onto your plate for each half. Using your hands, break your scone into two pieces. Using a knife or spoon, spread first with cream, then with jam. Please do not create a sandwich. Eat and repeat. 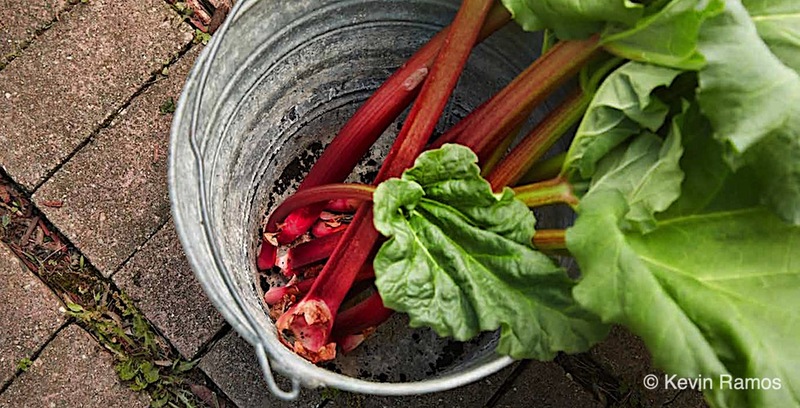 Native to Asia and now found around the world, rhubarb has been grown for medicinal purposes for centuries. Nonetheless, as a food, rhubarb is a relative newcomer; the first rhubarb crops grown as a food date back to the 1600s. The first recipes calling for rhubarb are even more recent, dating back to the early nineteenth century. Love rhubarb? Check out Corrine’s Rhubarb Cheesecake recipe. If you enjoyed this post, sign up for our newsletter now! Photography courtesy of Kevin Ramos.